Car Rental Burlingame - Search for the lowest rate! Discover the city of trees and compare the cheapest car rental in Burlingame..
Did you know that there are about 18,000 public trees within the city of Burlingame? Burlingame (population 29,000), is 13 miles south of San Francisco on “The Peninsula.” In 2000, Burlingame had a median family income of $91,309, making it one of the richest cities in the state. Called the “City of Trees,” Burlingame has many nearby beach parks, due to its proximity to both the San Francisco Bay and Pacific Ocean. Just south of Burlingame, this bayside park offers walking paths, picnicking, swimming, windsurfing, bicycling, jogging, fishing, boating, and sailing. Visitors may stroll along the beach promenade, visit the marina and its breakwater, look for shorebirds, or explore a saltwater marsh. The Magic Mountain Playground has slides, swings, and a three storey castle. The Coyote Point Museum for Environmental Education has natural history exhibits, plus aquariums, computers, games, films, and a wildlife habitat with native Bay Area live animals and plants. This vast Pacific and Bay park encompasses sites above, below, and within San Francisco. 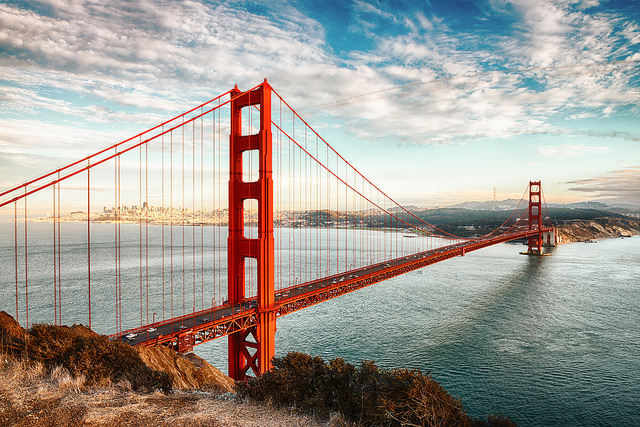 The Golden Gate National Parks chronicle two hundred years of history, from American Indian culture, the Spanish Empire frontier and the Mexican Republic, maritime history, the California Gold Rush, the evolution of U.S. coastal fortifications, and the growth of urban San Francisco. Near Burlingame are Alcatraz Island, Baker and China beaches, The Cliff House and Sutro Baths, Crissy Field Marsh and Beach, Fort Mason, Fort Point National Historic Site, Lands End, and Ocean Beach. The Museum of PEZ Memorabilia (above) has a quirky collection of approximately 400 PEZ candy dispensers, plus jigsaw puzzles, watches, and books on the toy's history. The Kohl Mansion was a Tudor-style home built for music and parties in 1914. The movie “Flubber” was filmed there. The Burlingame Railroad Station Museum was the first permanent building in the Mission Revival style in San Mateo County. Burlingame is just minutes by car or Bay Area Rapid Transit from the airport. There, a series of rotating multicultural and natural history displays abound throughout the terminals. The Louis A. Turpen Aviation Museum, in the new international terminal, is an adaptation of the original 1937 passenger waiting room at Mills Airfield. A collection of historical items chronicles commercial aviation in the Bay Area, including the 5,000 volume San Francisco Airport Commission Aviation Library. In nearby San Mateo, shoppers find fashion, home outfitting and other retail stores, and a range of dining options. Major stores include Target, Old Navy, Home Depot, Bed, Bath & Beyond, Toys-R-Us, Ethan Allen, Hallmark, ULTA, Pier 1 Imports, and Sports Authority. The center's Ice Chalet skating rink which offers public skating, party facilities, hockey, and skating programs. Sometimes, the best holidays are the self made types. Forget flying everywhere, see the scenery along the way, rent a cheap Burlingame car hire. Enterprise Burlingame, Carolan Ave(ex2349 - 778 Burlway Rd, Burlingame, . Hertz Hyatt Regency - 1333 Old Bayshore Highway, Burlingame, . Hertz Sfo Marriott Waterfront - 1800 Old Bayshore Hwy, Burlingame, . Hertz Burlingame-putnam - 101 California Drive, Burlingame, .